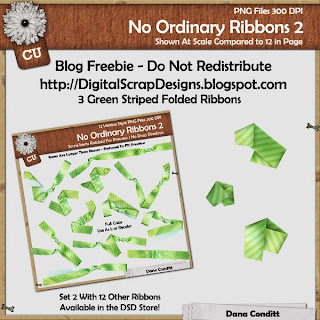 I scanned in a new set of ribbons, these would be great for any kit - use as is or easily recolor. 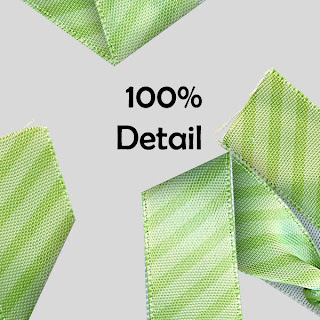 Green striped ribbons with folds, ties and staples. And I also made up a little freebie to go with it, see below. This green color would be great for your spring or St. Patrick's day kits, or recolor to go with any theme. 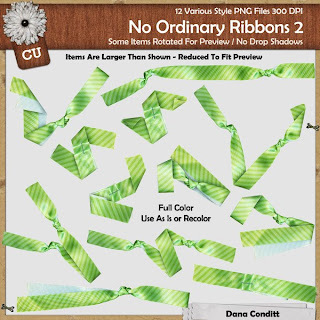 Pick up the 12 Ribbon Set in the DSD store here! On Sale through March! THIS FREEBIE HAS EXPIRED! PLEASE CHECK THE BLOG FOR OTHERS! Thank you so much for this Freebie. I want to let you know that I posted a link to your blog in CBH Digital Scrapbooking Freebies, under the Page 18 post on Mar. 01, 2010. Thanks again. Merci beaucoup Dana, ces rubans sont très jolis ! !